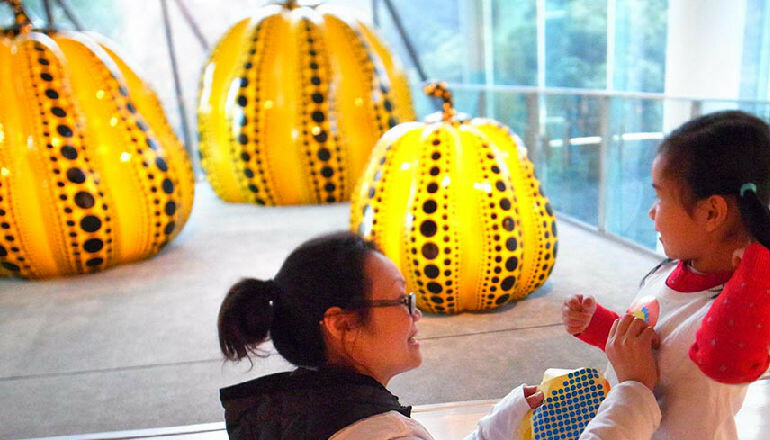 On January 18th 2014, artspire organized two visits to the Yayoi Kusama Art Exhibition; the exhibition was extremely popular and packed with fans and admirers! Our students and their family participated with expectations and excitement; they too had loads of fun! At first, they saw the ‘Infinite Mirror Room’. Upon entering, they first reaction was ‘Wow! Stunning!’ Teacher Mirai then ask our students, what can’t we see the end of the room, like there are countless stars in the infinite space? What was used to create such an effect? Children got the answer right away, YES! It’s MIRROR! Mirai gave everyone a lecture on some of Yayoi Kusama’s works, and raised many questions for our students. After seeing everything in the exhibition, the group took part in a interactive game called ‘Paste the dots competition’, designed by teachers of artspire to consolidate the understanding of dot elements; it was fun and even the parents became every competitive, atmosphere was simply electric!